New Zealand were popular winners with the Japanese crowd after the world champions beat first-time Cup finalists France 24-12 to complete a successful defence of the HSBC Kitakyushu Sevens title on Sunday. The two teams had met in the final match of day one with the Black Ferns Sevens running out convincing 38-7 winners at the Mikuni World Stadium, but the final was a much closer affair and only settled after late scores by Portia Woodman and HSBC Player of the Final Tyla Nathan-Wong. New Zealand had lost Niall Williams to injury before the final but they made the perfect start with Michaela Blyde scoring in the opening minute. However, France regrouped and some good link play between captain Fanny Horta and Marjorie Mayans down the left created an opportunity they were unable to turn into the points due to the pace of Woodman. Les Bleues did draw level after a period of possession with some quick hands allowing Camille Grassineau to touch down under the posts, but New Zealand edged ahead once more when Theresa Fitzpatrick broke through to score on the stroke of half-time to make it 12-7. New Zealand lost Gayle Broughton to the sin-bin early in the second half and in her absence France struck once again through Montserrat Amedee, failing to take the lead for the first time after Jade Le Pesq was unable to add the conversion. The next score would be crucial and it arrived in a familiar fashion, Woodman receiving the ball out wide and her burst of acceleration enough to take her around the French defender and away for the try, leaving Nathan-Wong to make certain of the win with their fourth try. “There were some massive plays there, the girls really stepped up. We have had a couple of injuries over the last few weeks and to come away with back-to-back golds is pretty special and I can’t wait to get home and celebrate with our families,” said New Zealand captain Sarah Goss afterwards. Coach Allan Bunting added: “It is pretty special, we always want to do well and then to do really well at the Commonwealth Games and to back it up here is really satisfying. I think the last couple of weeks we have done a lot of learning and growing and we have got some really good foundations in our program and those foundations are building towards Tokyo which is great. The victory sees New Zealand cut Australia’s lead in the standings to six points with two rounds to go in Langford and Paris. Russia are a further eight points adrift on 42 after finishing fifth, while France’s runners-up finish means they now sit fourth with 40 points with Canada and Spain completing the top six with 32 points. Australia avenged their day one loss to Spain – their first since 2013 – with a 19-5 victory to claim the bronze medal for the second year running in Kitakyushu, although they had to come from behind to do so after Ingrid Algar scored an early try for Las Leonas. Australia’s response was swift with Evania Pelite shrugging off a tackle to race clear and the score remained at 5-5 until midway through the second half when Emma Tonegato broke through and it was left to Emilee Cherry to wrap up victory by converting her own try with the last act. 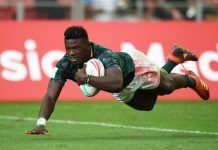 In the first semi-final Australia and New Zealand came face-to-face only seven days after producing a scintillating display of sevens in the Commonwealth Games final and the most successful teams in series history duly served up another classic encounter for the Japanese fans. The outcome was ultimately the same, with New Zealand scoring 17 unanswered points to triumph 17-12, but the manner of the win a little different with Australia this time racing out to a two-try lead with Pelite opening the scoring before Alicia Quirk drew the defence and put Tonegato into the gap. The Black Ferns Sevens hit back with tries from Broughton and Blyde to cut the deficit to 12-10, the latter after a forward pass had denied Kelly Brazier a certain try. Both sides created opportunities to book their tickets to the final but it was Tyla Nathan-Wong who scored the match-winner, New Zealand regaining possession to allow Brazier to run the ball into touch, rather than break away to score the sudden-death extra-time winner of a week ago. History was guaranteed whatever the outcome of the second semi-final with Spain and France bidding to reach a first-ever Cup final and with Le Pesq pulling the strings it was Les Bleues who claimed that honour with a 21-0 victory. Le Pesq had looked set to give France the lead but a last-ditch tackle by Amaia Erbina managed to put her off-balance and into touch as the line beckoned. Horta gave France the lead on the stroke of half-time and try as Spain did they were unable to breach the defence, instead tries by Amedee and Nassira Konde wrapped up the win. Earlier in the day, New Zealand had proved too powerful for first-time Cup quarter-finalists China with Blyde and Brazier scoring a brace in a record-equalling 50-0 victory. The Chinese, who will join the 2019 series as a core team, battled bravely to the finish but found it hard to live with the pace that the Black Ferns Sevens played and were unable to score their first points against them. Australia had described themselves as “a bit rusty” on day one but they capitalised on a Fijian yellow card to score early tries through Demi Hayes and Tonegato before adding a third for a 17-7 half-time lead when Emma Sykes burst through a tackle to run under the posts while they were a player light with Cherry in the sin-bin. Two quick tries, through Pelite and Tonegato, put the match beyond Fiji and Australia ran out 31-7 victors in a repeat of the 2017 bronze medal match in Kitakyushu. Some incredible defence from Spain repelled wave after wave of England attack in the first half before Deborah Fleming managed to find away through as half-time approached. Spain were able to get their hands on the ball more after the break and were rewarded when Maria Ribera followed up her match-winner against Australia in the Pool A decider with another key try, the conversion by Patricia Garcia proving the difference in a 7-5 win that gave Las Leonas their first Cup semi-final appearance since the first series event in Dubai back in 2012. Russia finished on a high note with a fifth place finish for the second year running in Kitakyushu, Baizat Khamidova and captain Mikhaltsova scoring a brace in the 30-7 defeat of Fiji, the latter taking her tally for the tournament to an impressive 11 tries. England were also too strong for China in the seventh place play-off, Lydia Thompson and Jess Breach among the try scorers in a 36-5 win but the Asian side were able to leave Kitakyushu with their best ever finish on the series. China had earlier given another glimpse of what they will offer on the series next season after Chen Keyi scored twice to give them a 19-7 lead against Fiji in the fifth place semi-final. However, they were unable to close out the match with Miriama Naiobasali and Pricilla Sauvavi Siata scoring to tie the scores before, with time up on the clock, Ana Maria Naimasi was put over in the corner. The other semi-final was a much more straightforward affair with Mikhaltsova leading by example to score a record-equalling five tries for Russia in a 41-0 defeat of Commonwealth Games bronze medallists England. A sudden-death extra-time try by captain Nicole Heavirland – her second of the match – gave USA a 24-19 victory over Ireland in the Challenge Trophy final. Alev Kelter’s try looked to have secured the win in normal time, but her missed conversion ultimately proved crucial after Ireland captain Lucy Mulhall scored with time up on the clock for the second match running and nailed her kick to tie the scores at 19-19. The 11th place play-off could not have started better for Japan with tries from Iroha Nagata and Yukari Tateyama delighting the home crowd, but the 14-0 lead didn’t last long as an injury-hit Canadian side found their feet to score five tries for a 33-14 victory. Earlier in the semi-finals, USA faced Japan for the second time this weekend in Kitakyushu, having beaten the hosts 45-17 in their final pool match. The outcome was the same with the Women’s Sevens Eagles enjoying a 34-14 victory thanks to second-half tries from Alev Kelter, Ryan Carlyle Kirsten Thomas and Jordan Gray . Japan, though, delighted the crowd with two tries from teenager Yume Hirano. Canada looked on course to set up an all-North American final after Julia Greenshields’ try gave them a 19-12 lead with only a minute to go, but then Ireland broke down the left touchline through Amee-Leigh Murphy-Crowe. She was alert to the need to score near the posts and slowed to offload to captain Lucy Mulhall to dot down and then add the conversion to tie the scores. Canada, having missed out on the Cup quarter-finals for the first time in series history and lost stand-in captain Brittany Benn to injury, were then unable to stop Kathy Baker from scoring her first series try to secure a 24-19 victory. The fourth and penultimate round of the 2018 series takes place in Langford, Canada, on 12-13 May, where Brazil will join the 11 core teams as the invitational side. Next articleTwo Powell River High School Gymnastics Teams Top the BC Championships! !